I initially had a completely different design all mapped out. Which is surprising that things changed along the way, as I spent a good amount of time drafting out different ideas before settling on a particular favourite. But when it came time to actually start cutting the Riley Blake Designs Sashing Stash fabric, inspiration hit and I just had to go with it! This design was a little more work than I anticipated. Having tackled the Libs Elliott Weight of Love quilt top, I thought these little jewels would be easy peasy. And, in theory, they are. I mean there is a little less cutting and piecing to get the flowers put together, but what I hadn’t factored in was the fact there would be even more “Y” seams than with the traditional hexie…ugh. While I can certainly do the “Y” seam, they are time consuming to pull together. And with these little jewels, a ¼” from the top of each petal needs to be left unsewn; which I only realised after I had started sewing them together! And it also meant a lot of measuring and precise sewing. AKA chain piecing becomes limited. 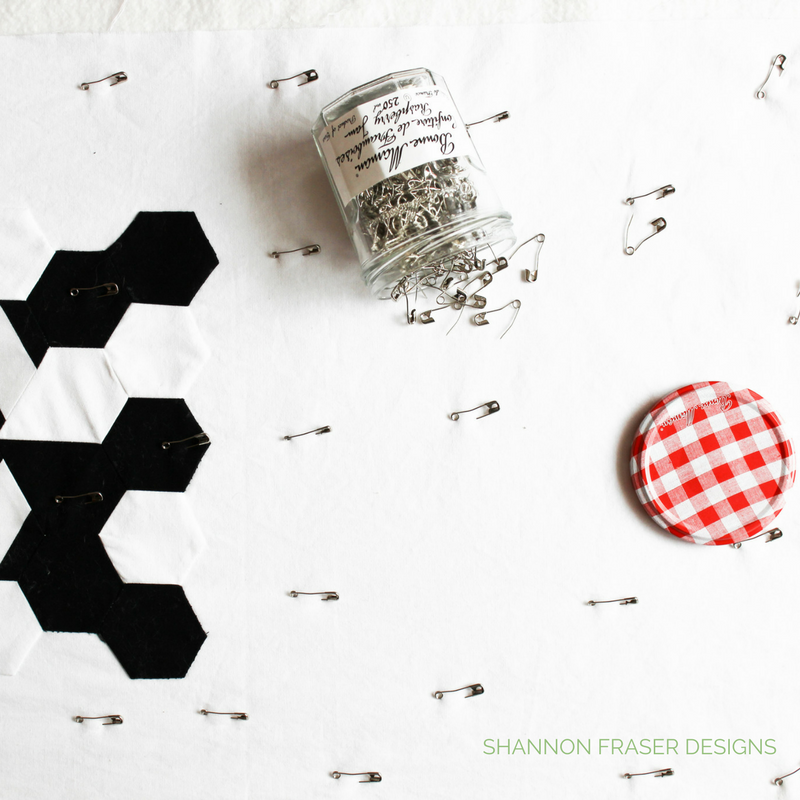 And I do love me some chain piecing! It was fun to put my Hex-N-More ruler to use again. I always worry when buying specialty rulers that I’ll use them once and never touch it again! If you need some quick tips on how to use this ruler, check out my tutorial here. That challenge aside, these little jewels are super cute and I love how the geometric nature of the Riley Blake Designs prints really pop in this design. Plus, I just love a black and white combo. 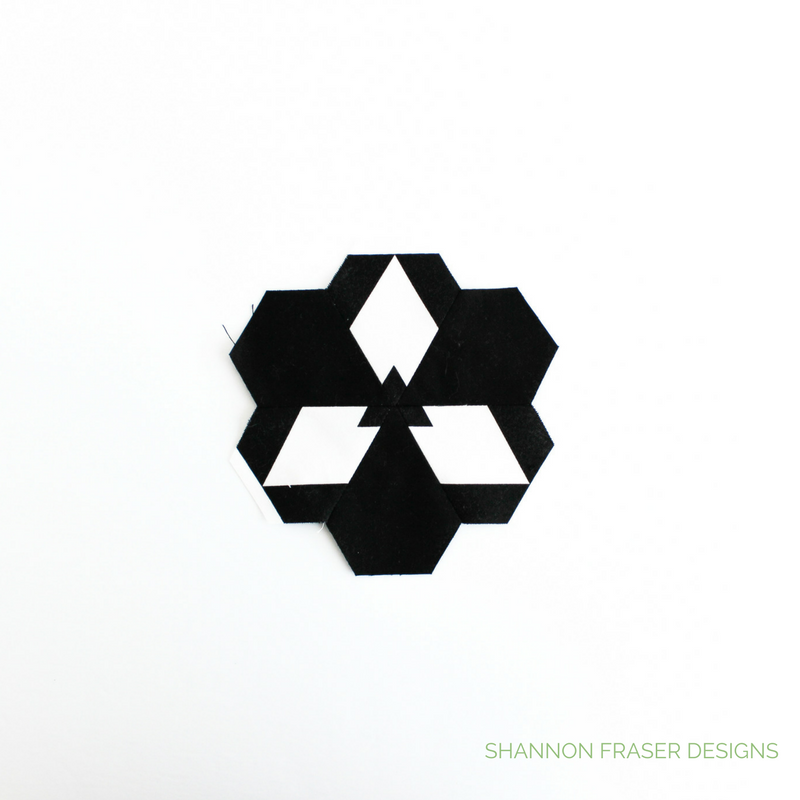 Once I had the jewel flowers stitched together, I decided to pull everything together by surrounding the flowers with black and white hexies. Since this center panel was taking so long to create, I decided to scale back on the size of the finished quilt and opted for a table runner instead. With a huge bolt of Kona Cotton in white in hand, I decided to keep with the black and white theme and lay the panel on a white background. To prep for attaching the panel to the background, and hopefully speed things up, I marked all of my ¼” lines. My Pilot Frixion pen was perfect for the white fabric, but wasn’t showing up on the black. I was really happy when I found a blue pencil that worked perfectly for the job! Even with scaling back on size, this project stalled a little (or quite awhile) at the hand needle turn appliqué stage! 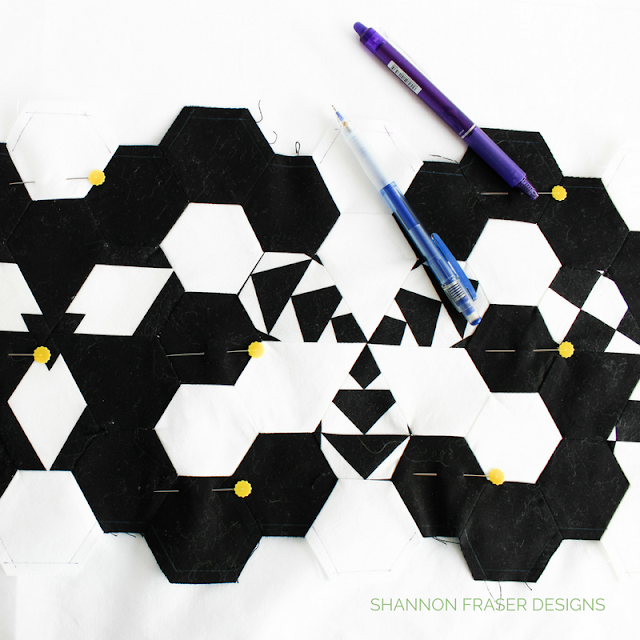 I quite enjoy hand sewing work, but hand needle turning every little edge of the hexies was kind of painful to me. It was slow going and fiddly. Not my idea of fun! Towards the end, I decided to flip each ¼” seam under and pin it in place. This made the hand appliqué work a little quicker and more straightforward, which was much more enjoyable to me. As soon as I got the panel attached to the background, I felt a huge sense of relief! Like I had overcome a huge hurdle in the quilting journey and it felt wonderful to be past that stage! I quickly got her basted and spent some time thinking through how I wanted to quilt her. I had originally planned on using white thread with a few shots of a bold colour, like red. 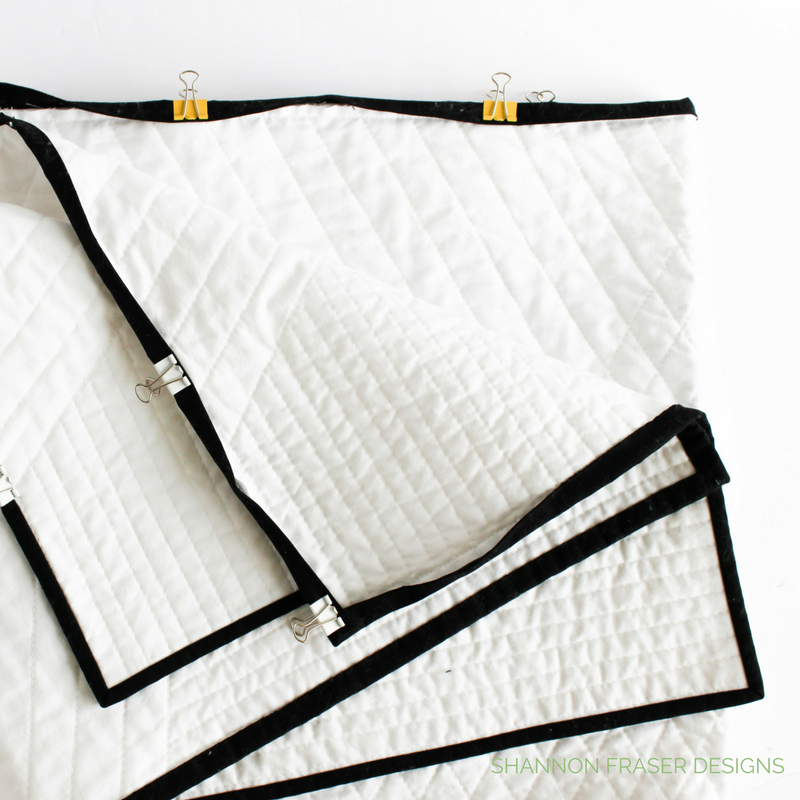 But once I got started quilting, I was concerned the red would take away from the black and white theme and so I stuck with my trusty Aurifil Thread in white. However, I did choose to mix up the quilting a little. 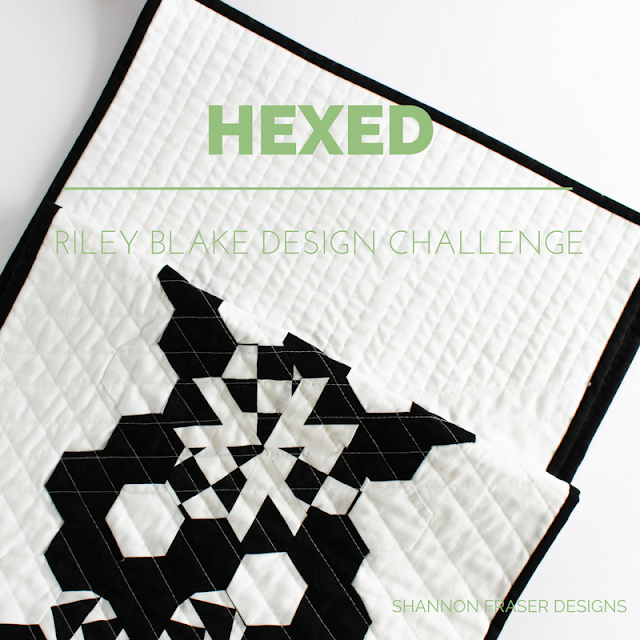 I started off with diagonal straight lines in the central hexie panel, which created a quilted diamond pattern that is super pretty. For the negative space at either end of the panels I opted for narrow parallel straight lines running perpendicular to the hexies. 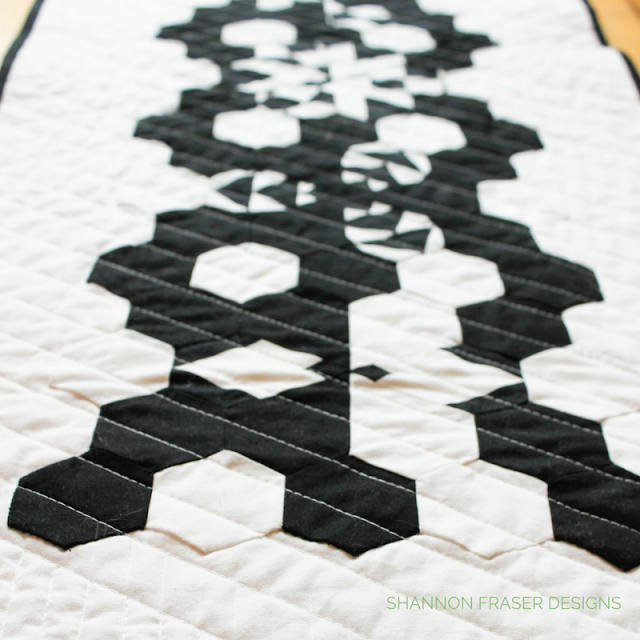 I love how this approach added visual interest and some yummy quilted texture. I absolutely love the look from the back too! 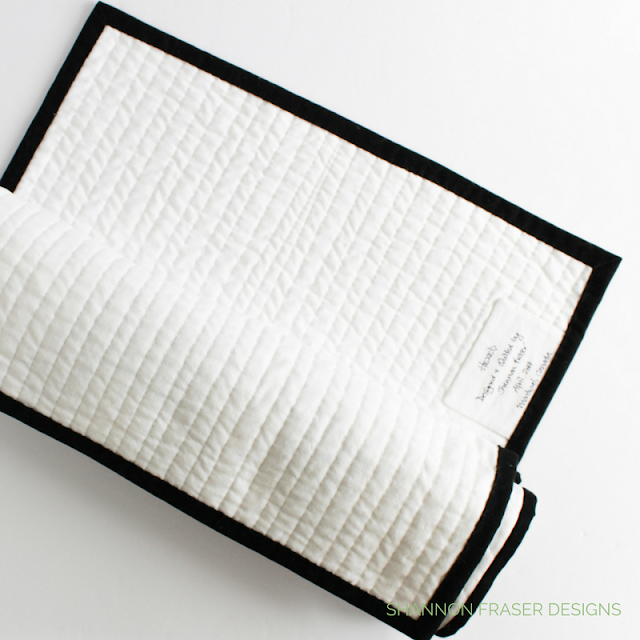 To frame the table runner, I thought a black binding would be the perfect solution. And was it ever! I love how much contrast it adds to the final quilt. The only issue I have now is convincing friends and family that it CAN be used as a table runner! Everyone is so concerned about it getting stained, they’re reluctant to put her to good use. 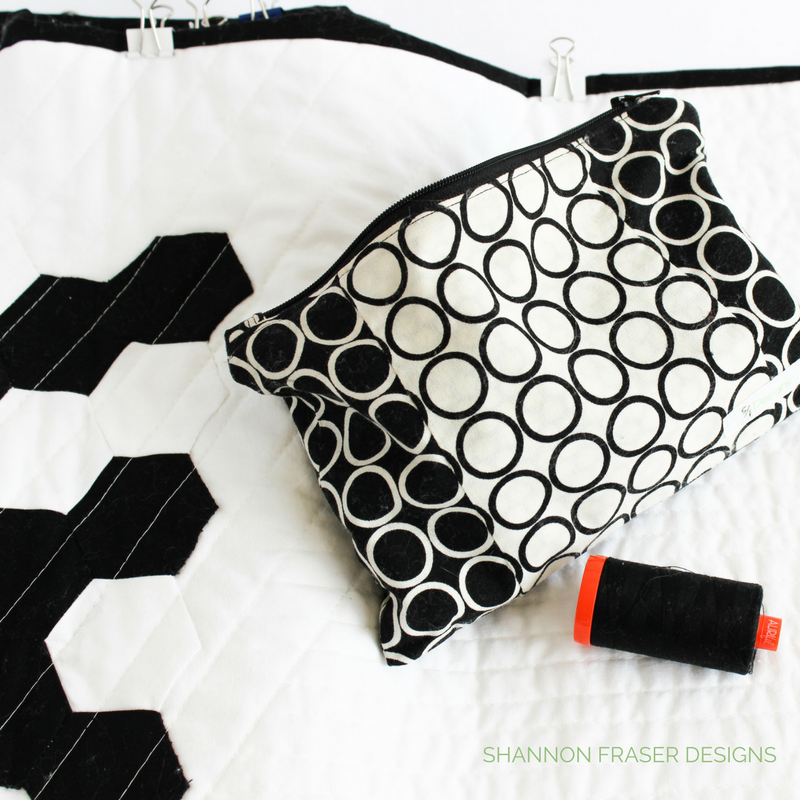 Do you worry about using your quilty projects? Especially ones that have a higher likelihood of getting stained? 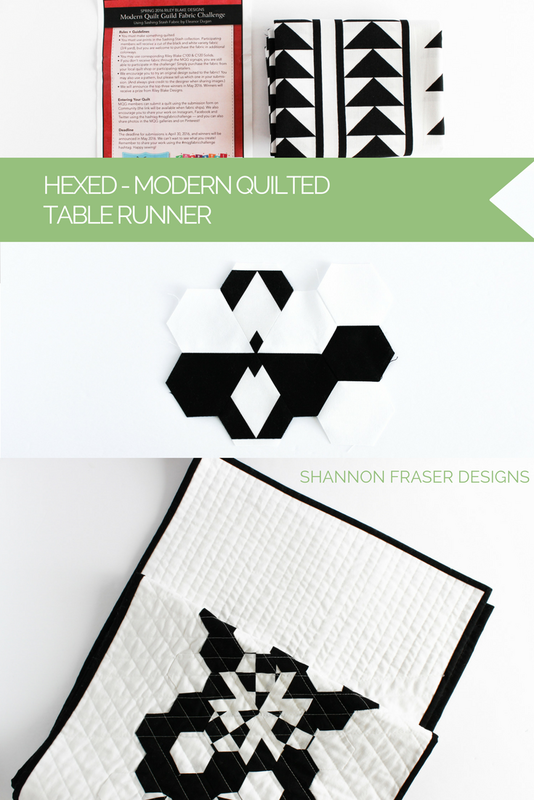 I keep saying that the quilted table runner is meant to be used and if it gets stained, it gets stained. What are your thoughts? Although this project sat idle for several months, I’m so happy I kept at it and finished her off. 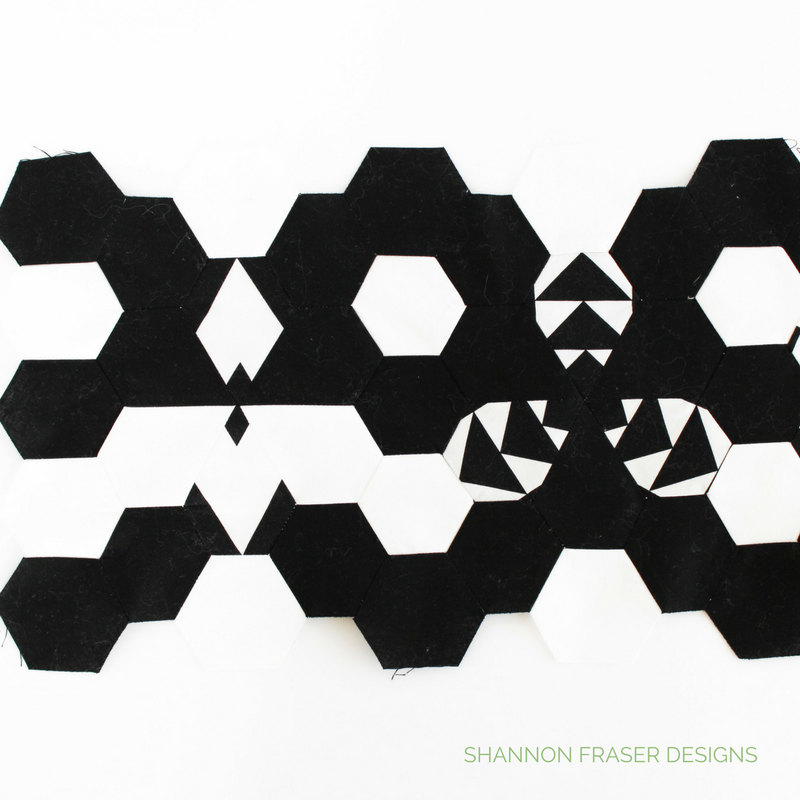 I learned so much during this quilting journey. First, sometimes you may have a plan, but when inspiration strikes it’s good to go with it. Second, this journey reconfirmed that I love working without a pattern. I love making it up as I go along. 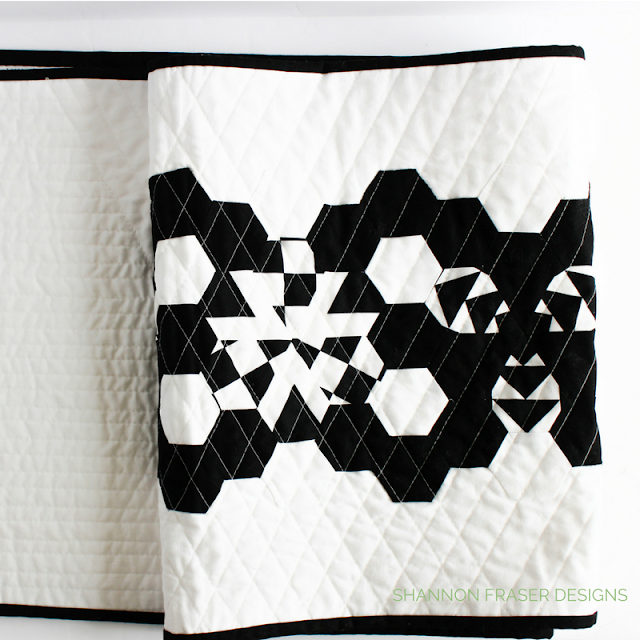 This proves much more time consuming as I mull my options, but I just adore thinking through the quilt design. And, lastly, I feel really accomplished in pursuing a project that was a challenge to get through. She’s been sitting on my Finish-A-Longlist since Q2 2016! Wow, that’s a long time in the making! I think this little pretty will hold a special place in my heart because of that. This post uses affiliate links. For more information, visit the FAQ page. Congratulations on moving this WIP to completion! 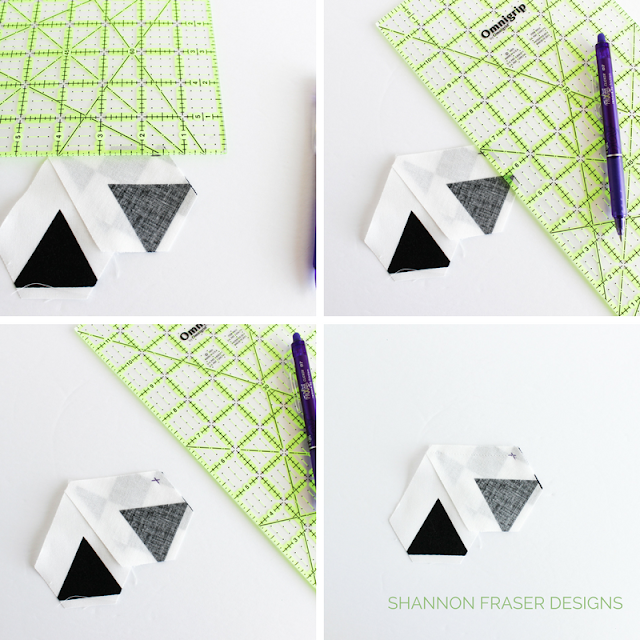 Sometimes projects just need more time to percolate, and I hope that you find that is the same for everyone feeling like they can use it as a table runner, too (they'll warm up to it)! Thank you, Yvonne! It feels good to cross her off my list 😉 Yes, let’s hope everyone warms up to the idea of putting her to good use!! Stunning quilt Shannon! I have the hex n more ruler and I've used it once which is better than some of the other rulers I have! Thank you, Sue! I try and resist buying specialty notions, but the Hex-n-More ruler has been quite handy to have. Yes!! Exactly 😊 It gives us an excuse to make more and we’ve always got the pictures to remember our makes by!! Genius piecing. I love the Quilting too. Maybe try it as a bed runner instead of on the table? That way it still gets used, but less chance of stains. That's a genius idea, Ronni! Thank you for the suggestion!